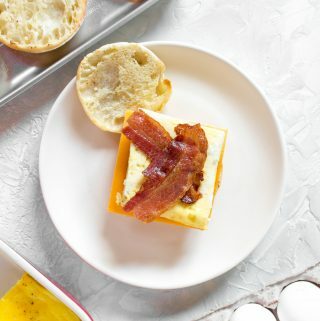 Skip the drive thru in the morning and make your own freezer friendly breakfast egg sandwiches. Make a batch, freeze it, and have a sandwich for breakfast everyday! Disclaimer: This recipe was made in partnership with Egg Farmers of Canada. Thank you for supporting the brands who support me to make this blog possible. Who’s up for a delicious breakfast meal prep? I’m going to be honest, whenever I have a super early shift at work and H drives me to work, we indulge and go through the golden arches’ drive thru for a breakfast sandwich. This year, I’m aiming to be a little more prepared when it comes to these last minute morning outings. So, I’m working on creating more freezer friendly breakfast meal preps. I plan on making a large batch that will hang out in my freezer so I can pull them out whenever I’m in need of a quick, easy breakfast. I always try to keep the recipes on my blog healthy because I want to share how easy it is to eat healthy and still be budget friendly. Eggs are one of the most budget friendly ways to meal prep and eggs are the highest quality source of protein available which contributes to a healthy, balanced diet. One serving of Canadian eggs includes 65% of your daily requirement of B12, which plays a role in in preventing heart disease. Because of these health benefits, eggs are a great ingredient to incorporate into your daily diet for a healthier 2019! 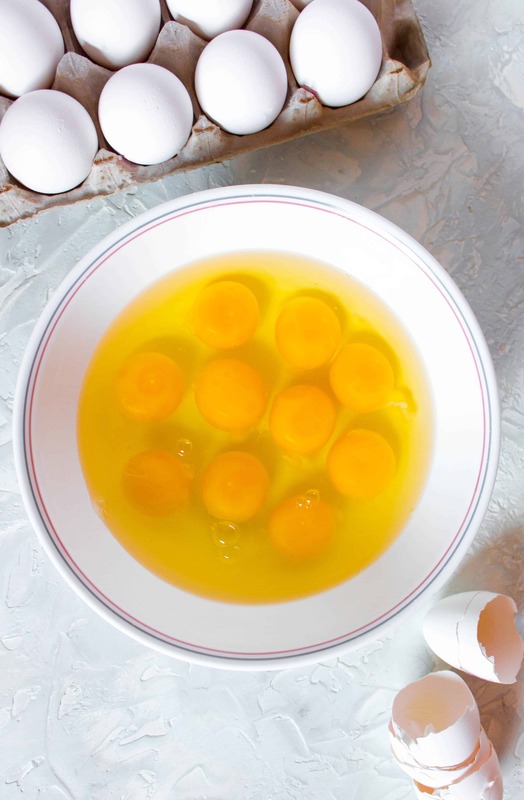 In a large bowl, beat together your eggs before adding in milk, salt, and pepper. You can also add additional seasonings if you’d like (such as garlic powder, paprika, etc). Once mixed, pour into a 5.5 x 4 inch baking dish (sprayed with non-stick). Set aside. 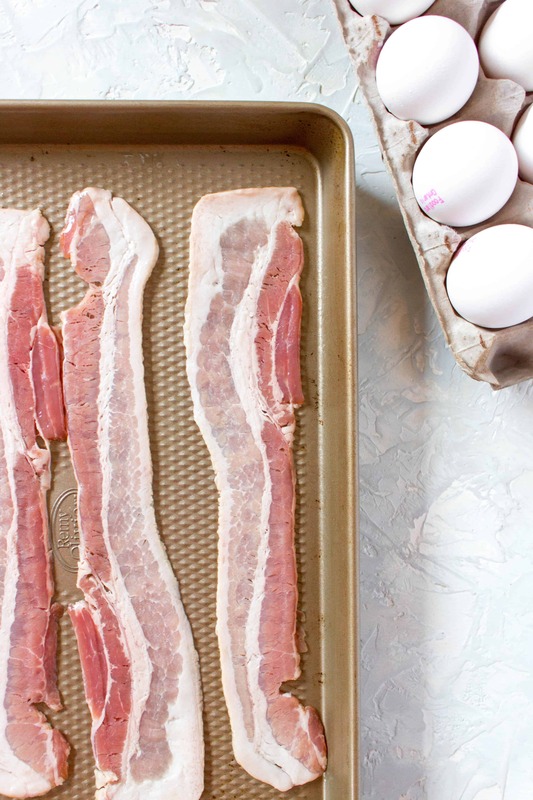 On a large sheet pan, place your bacon strips on evenly. Set an alarm for the oven for 35 minutes. At the 20 minute mark, pull out your bacon and let cool. Let the eggs cook until the 35 minutes are up. Optional: you can also place your english muffins in the oven as well to toast them if you prefer a toasted bun. Once your eggs are done, pull them out as well. Cut your eggs into 6 equal pieces and your bacon strips in half. 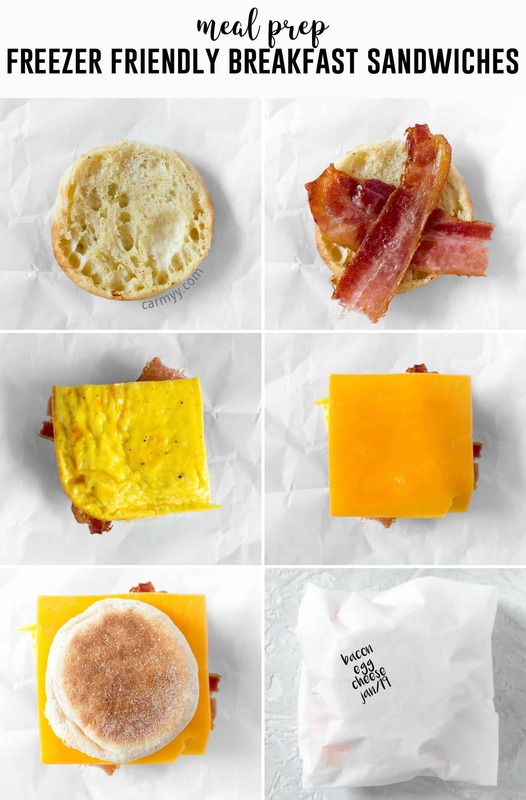 Finally, assemble your breakfast sandwich in the order you wish it to be. Wrap each sandwich in a square of parchment paper or tin foil. Then before putting it into a freezer friendly ziploc bag or airtight container, use a permanent marker to write the contents and date on the sandwich (or write it on the ziploc). Be sure to unwrap the sandwiches first. Place a paper towel under your sandwich and reheat the frozen breakfast sandwiches in the microwave. Microwave for 1.5 to 2 minutes until the sandwich is hot all the way through and the cheese has melted. In a toaster (or regular) oven, heat the sandwich for 10-15 minutes at 350F. In a large bowl, beat together your eggs before adding in milk, salt, and pepper. Once mixed, pour into a 10.5" x 7.5" baking dish (sprayed with non-stick). Set aside. Wrap each sandwich in a square of parchment paper or tin foil. 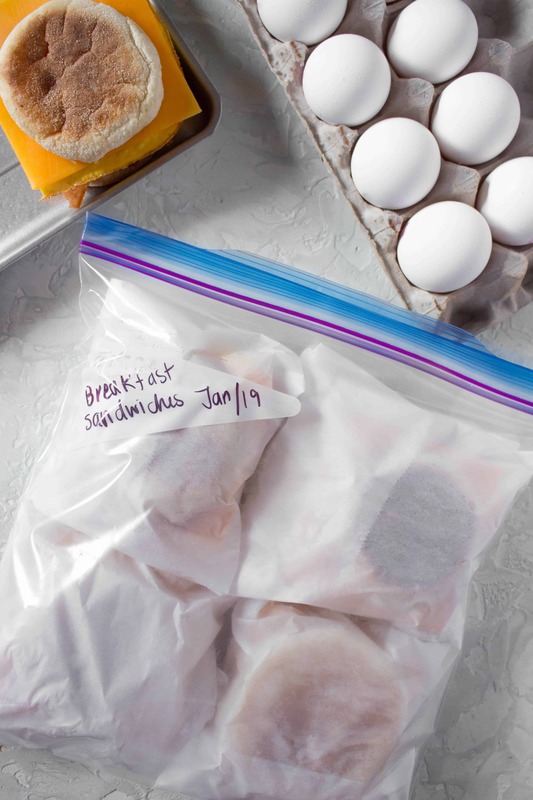 Then before putting it into a freezer friendly ziploc bag or airtight container, use a permanent marker to write the contents and date on the sandwich (or write it in the ziploc). 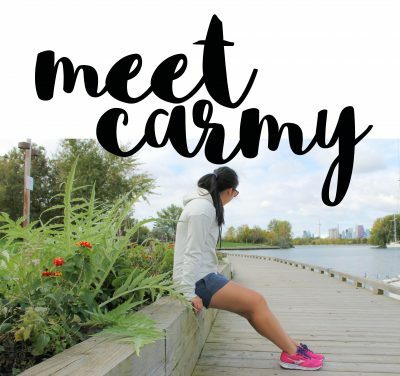 This is a genius idea, Carmy. 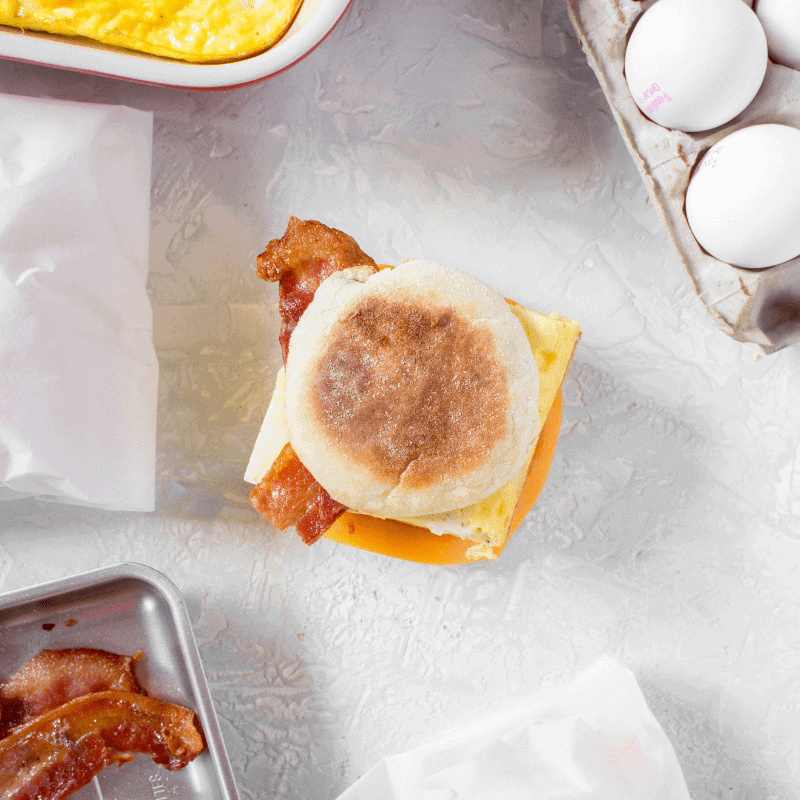 Breakfast sandwiches are always a smart start to the day and prepping them ahead of time for a weeks worth of meals just makes sense. Way better than a bowl of raising bran, too! I’m also really loving the way you’ve baked the eggs so they just get sliced to fit on each sandwich. That’s really smart. Girl you are speaking my breakfast love language. I have super early mornings too so I usually just hard boil a bunch of eggs and grab and go with them all week. But it’s sooooo boring. This is a WAY better idea – while still being pretty healthy but SO much tastier!! What a fantastic idea. I love a savory breakfast and eggs are one of my favorites. This sandwich would be wonderful on those busy mornings when I don’t want to cook plus don’t have time. It’s delicious and ready to go!! This recipe is a keeper. I have a complicated relationship with breakfast. On the one hand, I love a good breakfast meal, and I’m particularly fond of breakfast sandwiches (though I try to take the DIY route when I can, as the fast food versions are often so salty and high in calories). On the other hand, I’m often not in the mood to make anything substantial early in the morning. 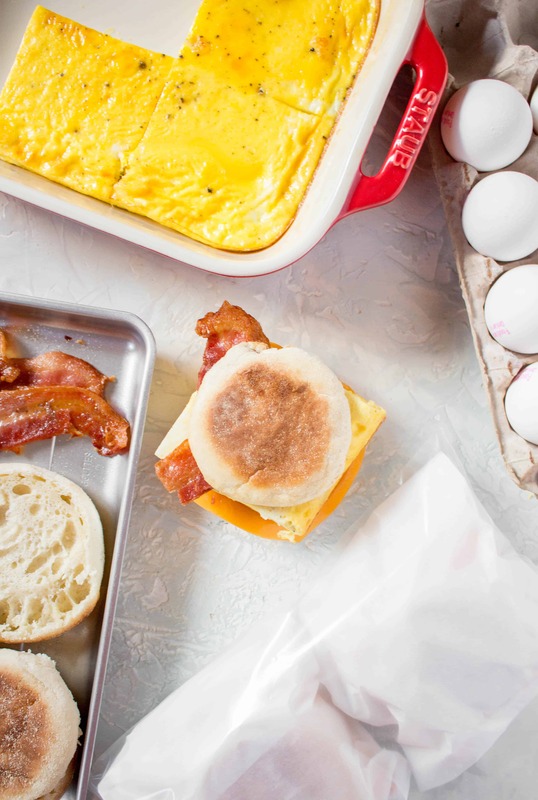 The idea of a freezer-friendly breakfast sandwich is right up my alley. Given how busy our lives are these sound like a godsend! Thanks for the idea – I think I’m going to have to make some room in the freezer now! Cheers! This is such a great idea. 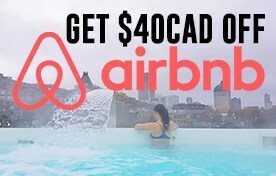 Not only do you save time, but you save $$ as well. Plus when you make it yourself, you can customize (I would put a squirt of hot sauce or sriracha on each) for health or taste preferences. No excuses to skip breakfast. Ooh yum, these sound like a great breakfast option. I am glad you included re-heating instructions for the oven, we don’t have a microwave and I always thought it would be a pain to re-heat something like this without one, but sounds totally doable! This is such a good idea! 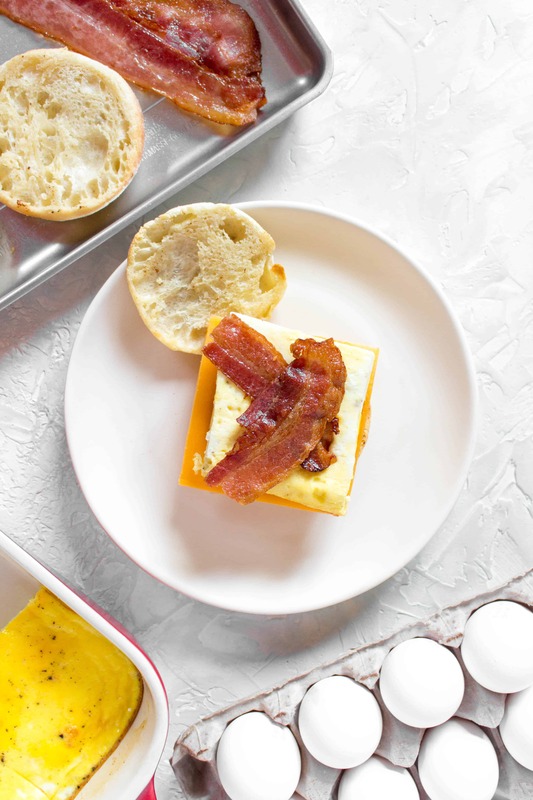 We like just simple egg and cheese muffins but rarely eat them. Gotta try this out thanks for the inspo! Oh my god these are AMAZING. I’m going to make so many of these before I have my baby because I am *so* going to need a quick, filling, and nutritious breakfast for myself. And breakfast sammies are SUCH a treat!